There is a provider in our industry that is offering a FREE website for a year, and then you might end up only paying $25 a month or $50 a month to LEASE the site. No, it’s not a portable site, and you can’t take it with you and have it run on another host like GoDaddy. But that’s a topic for another day. The question is — is a FREE / CHEAP website a good idea? I understand that some innkeepers are having a hard time affording to upgrade their websites for ADA, GDPR, Speed, Responsive, Mobile First, etc., which is why we released our New Standard option in January 2019. Unfortunately, we are now seeing Innkeepers falling for this FREE or CHEAP sales pitch, and I’m afraid they are going to be in for a rude awakening. Acorn has an Innkeeper who has been a client since 2004, who’s website is also just that old, ask me for my opinion on these FREE site options. And in true Acorn fashion, instead of an opinion, I was able to provide facts. I was able to provide facts because we recently had another Innkeeper who decided that $100 a month with Acorn was too much for a new quality site, especially when he could get his site for FREE for a year, if he chose to move over to this other provider. Low and behold, this new provider never bothered to shut down access to Google Analytics (GA). I’m sure after this post goes public, that access will be removed ASAP. But in the meantime I was able to compare the GA data on the 10 year old site vs. to the GA data on the new FREE site from this other provider. See below. Spoiler Alert: I seriously thought when this client left to get their new FREE site, that surely this newly updated FREE website would improve traffic and encourage potential guests to hang around longer on the site. I also “assumed” a new FREE site would surely have to have a lower bounce rate, as the old site was 10+ years old. And frankly nothing on the old site had been keeping up with Google standards. It was not ADA, GDPR, or Responsive. November 2018 – January 2019 vs. November 2017 – January 2018. User traffic dropped 4.49% with the new FREE site. But even worse, people were bouncing off the new site way more than they were with the 10-year-old site. A bounce means the visitor goes to the website, and never looks at any additional pages, they leave from the page they landed on. The old site had an overall bounce rate of 39.62% the new site had an overall bounce rate of 54.16%. That’s almost 15% of the 4.49% less visitors coming to the site weren’t looking around at other pages. Not to mention, the number of pages being looked at dropped along with the overall duration of the time spent on the site. 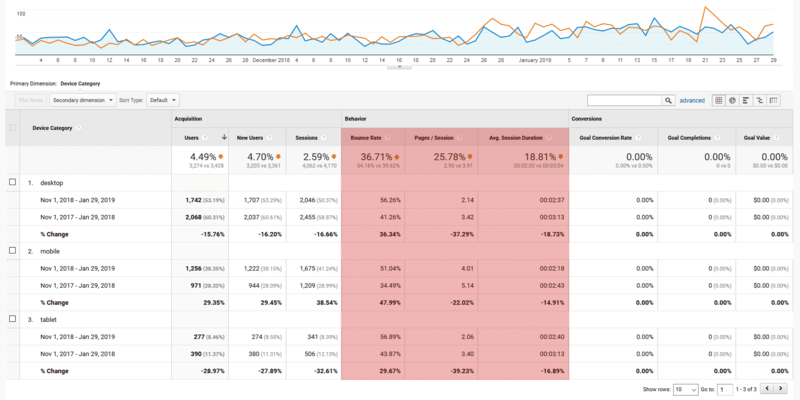 Look at the bounce rate breakdown. It’s not just desktop that’s causing guests to bounce off the site, it’s mobile and tablet too. So why might the bounce rates be so high? One reason may have to do with load time. These FREE sites take an inordinate amount of time to load. A fast loading site takes time and effort in both Research and Development (R&D) to make them run fast. Not typically something a company is going to invest in when they are giving away websites for FREE, $25 or $50 a month. 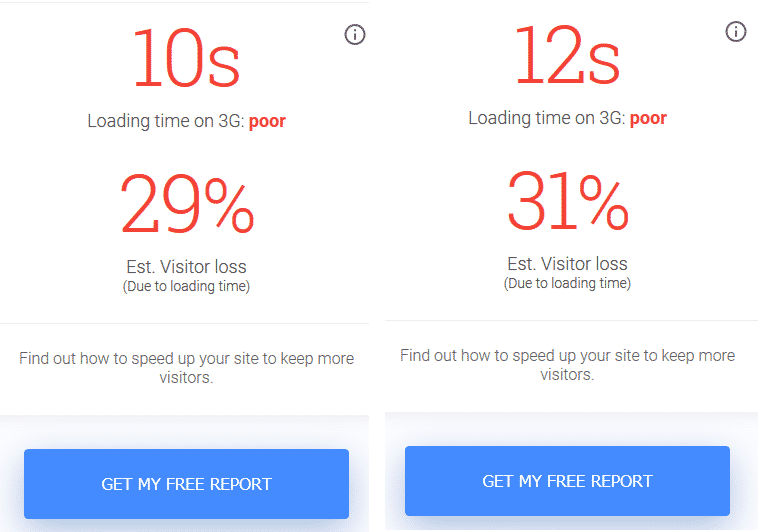 According to Google’s Test My Site online testing program, an estimated 29% to 31% loss of visitors will occur before the site loads. When this happens, you are losing clients before they even have a chance to get a full picture of your website and what you offer. Every Innkeeper needs to take into consideration that these NEW FREE, $25, $50 a month sites may really not be such a good idea. I have to admit, the results even surprised me that these NEW FREE sites performed so much worse than the website we built 10 year ago. You might be saving money on a new website, but you could be losing thousands of dollars in lost bookings by doing so. Bottom Line: The saying “A penny wise but a pound foolish” comes to mind. Finally, let’s take a 10,000 foot view of this topic. You need to ask yourself: “Why is someone trying to give me something so valuable for FREE?” We know that the necessary work that goes into a quality website takes time and effort. There is no way for a company to sustain a FREE or low cost service such as this and give you the best product possible. If you need or want to upgrade to a new website, contact our sales team at sales@acorn-is.com and let us show you how our new Standard Design can give you all you need and more to improve and keep your business safe. This entry was posted in designs, ethics, google by admin. Bookmark the permalink.